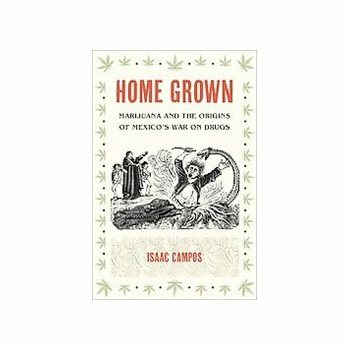 Editor’s note: Today’s entry in the Points Interview series is number twenty-seven, and features Isaac Campos-Costero discussing his recently published Home Grown: Marijuana and the Origins of Mexico’s War on Drugs (University of North Carolina Press, 2012). Between the 1840s and 1920, marijuana was overwhelmingly associated with two effects in Mexico– madness and violence. And I really mean overwhelmingly. There were hundreds of reports of marijuana turning its users into violent maniacs and such reports went almost totally unchallenged in published sources. Furthermore, the belief that marijuana caused violent madness appears to have been especially prevalent among the lower classes. In other words, it does not appear that these views were imposed on average Mexicans by propaganda campaigns from above. If you could go back to 1890s Mexico City and ask an ordinary person on the street to describe the effects of marijuana, they almost certainly would have told you that “it makes you crazy.” Of course today marijuana is associated with very different effects. Even the most aggressive drug warriors, in their most hyperbolic moments, would shy away from claiming that marijuana causes violence and madness. That just seems absurd given more recent experience with the drug. Thus my book explains how marijuana earned this reputation. In the process it documents pretty much everything about cannabis’ history in Mexico, from its introduction to the country as a fiber-producing industrial plant in the 1530s, to its nationwide prohibition in 1920. The book thus also traces the origins of prohibitionist drug laws in Mexico and hence the origins of Mexico’s war on drugs. Ultimately I argue that marijuana probably had some role in triggering “mad” behavior and even violence but not because marijuana necessarily causes such effects in any context where it is used, but, rather, because of what researchers have long referred to as “drug, set, and setting”—that is, the interaction between user psychology, the setting of the drug’s use, and the pharmacology of the drug itself. Simply put, what people think is going to occur when they take a drug is often as important as any other factor in producing a particular behavioral effect. Thus if you think a drug should make you lazy, it’s much more likely to make you lazy, and if you think it should make you crazy, it’s much more likely to make you think you are going crazy. Furthermore, marijuana is a substance ideally suited to convince people that “madness” might result from its use. It can produce anxiety, panic attacks, and even hallucinations at high doses (hence its classification as a “psychotomimetic” drug). But, again, like all drugs marijuana’s effects are highly conditioned by the social and cultural setting of its use, and the psychological “set” of its users. In Mexico, a country with the richest collection of hallucinogens on earth and where, since the sixteenth century, disputes over the use of such substances have been intimately linked to political and spiritual conflict, it is not so surprising that the use of marijuana would soon be associated with madness and even violence. And that association has had an enormous historical impact in North America. These ideas not only helped inspire Mexico’s drug-war policies but, as I demonstrate in the book, they also served as the foundation of “reefer madness” ideas in the United States. Thus these Mexican ideas were also crucial to the development of the U.S. war on drugs as we now know it, with marijuana as one of its “big three” targets alongside cocaine and the opiates. Well drug and alcohol historians already know about set and setting but this is the first historical monograph to deeply explore the likely consequences of these factors in the past. Furthermore, the literature on marijuana’s early history in the U.S. claims that marijuana came to the U.S. with Mexican immigrants who used the drug as a “casual adjunct to life,” and suggests that the use of this substance was a kind of mundane part of Mexican life before being demonized by racist Americans once it came across the border. But my book shows marijuana use in Mexico was relatively unusual (thus probably not that prevalent among migrating workers) and that Mexican ideas about marijuana began shaping U.S. discourses well before the big waves of immigrants started coming north during the 1910s. So the book raises a lot of questions for historians on the U.S. side of the border as well. I’m still fascinated by the historical impact of set and setting. If we know that the behavioral effects of drugs (and even phenomena like addiction) are dictated by psychology and culture as much as pharmacology, then the history of illicit drugs must have involved an important element of self-fulfilling prophecy (and I don’t just mean that prohibiting drugs makes drug users criminal by definition). Can we somehow show that changing discourses increased other kinds of drug-related behaviors? For example, did the stereotype of the “junkie” actually produce “junkies”? Did the stereotype of the “crackhead” produce “crackheads”? This is fascinating stuff. It’s the behavioral and even biological (in the case of addiction) impact of culture and discourse. Who was the first person to smoke marijuana in Mexico and what inspired them to do so? The first reference I have to the practice is from 1846 and I show quite clearly that, if it was being smoked before then, the practice was extraordinarily rare. But someone had to be the first person. Was the idea to smoke the stuff introduced from outside or did someone just decide to add some of it to his or her cigarette? Cannabis already had a medicinal and divinatory reputation in late 18th century Mexico even though it was not yet smoked (people drank it in an infusion). Since Mexicans pioneered the cigarette (another drug development with world historical implications), it seems plausible that someone at some point just decided to try smoking it. But the answer to this question remains a mystery and, unfortunately, I don’t think this stone will be unturned anytime soon. I’d like to do it so I could go off on long tangents about the research process and the sources and so forth which is as interesting to me as anything else. I’m sure the audio book publishers would love that. Thanks for the interview, I enjoyed it. I have long shared this thought: “Simply put, what people think is going to occur when they take a drug is often as important as any other factor in producing a particular behavioral effect. Thus if you think a drug should make you lazy, it’s much more likely to make you lazy, and if you think it should make you crazy, it’s much more likely to make you think you are going crazy.” Certainly the American creative literature supports this view. One person takes opium and writes about the experience; another person, who has not taken opium, smokes cannabis looking for the high he read about in the opium eater. And finds it. I suspect that placebo research would be the key to articulating and perhaps measuring the extent to which expectations govern experience. Placebo is a very interesting drug. If we knew more about it, I suspect we’d know more about all the drugs with recreational histories. I did not know that reefer madness in Mexico predated reefer madness in the US, that’s eye opening. I’ve been thinking a lot about the self-fulfilling prophecy in the medical cannabis community, and I find its juxtaposition with the contents of this post really fascinating. Compare a doctor telling you cannabis can help you overcome your mental illnesses and improve your overall social and physical wellness with what was happening a century ago. I bet the percentage of early 19th century Mexicans who would testify to the madness-inducing properties of cannabis is close to the percentage of SF Bay Area Americans today who would testify to the therapeutic properties of cannabis. From my knowledge the culture of cannabis as a therapy hasn’t really taken off in Mexico, nor in most of the US, but if we are to put credibility behind the self-fulfilling prophecy then medical cannabis seems like the better choice.